Things have been just whirling by this month--next week it's AUGUST!!! I am of course, not ready for summer to be gone. Most of my summer was spent recuperating, but I swear I had intended to clean out the house and take a bunch of stuff to Goodwill. Now I will be happy if I finish cleaning out my old desk at work. I would really love to have a cleaning lady to help me, but right now that is out of the budget. I do intend to revisit the idea--my sister-in-law and mother-in-law both have people come in to clean up the house, and neither of them work outside the home. Why not me? Cats just love boxes and small containers that they can squeeze themselves into, and Zena is no exception. 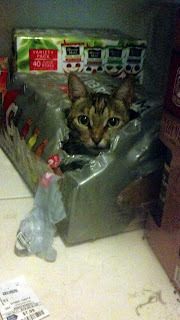 I suppose that she was attracted to the sound of the plastic, and it was nice and cozy in there. She does the same thing with the television receiver, even though it is behind glass. But I can't get mad at that face, and she knows it. So as long as she doesn't start chewing through electrical wiring, I don't make her move. Ooh! The royal baby has arrived! I'd feel sorry for the new parents, and sympathize with how little sleep they will be getting, except that this baby comes with a nanny, among other employees, to help out. I am sure that a number of us would give our right arms to be able to get a few hours of shut eye, let alone watch our child while we enjoy a full eight hours of uninterrupted sleep? I wonder if there is a Royal Diaper Changer, and if so, how much does it pay? I expect it might be a bit more than minimum wage. That certainly would be an interesting note on one's resume. My mom hands me a stretchy bracelet the other day. It has pink and white beads. Turns out that the beads were made from flowers. The flowers that were at my grandmother's funeral. A memento mori, certainly. I'd rather have had something else, but I guess that everyone grieves in their own way. I don't even know if my grandmother liked the color pink. I suspect that she did; the entire outside of the house was painted pink. 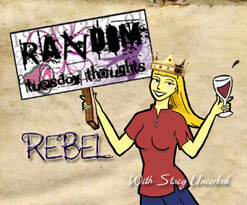 I do know that I am not fond of pink. When I see someone wearing all pink or driving a pink car, I automatically think of Mary Kay. Weird, I know! 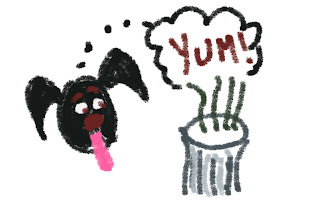 This is an artist's rendition of my dog. If it is stinky and in the trash, she has to have it. Especially if it is embarrassing, like one of those --ahem--feminine products. Yeah, those items are her very favorite. Maisy will get her nose into the can and pull the offensive item right out, which isn't the bad part. No, the bad part is that she takes the wad to the living room and quickly proceeds to tear it into shreds. Tiny, tiny shreds. Did I mention that the pieces are tiny? Try cleaning all that up in less than five minutes, when your parents have just texted that they are on the way. Go visit Stacy--help her stay sane while she packs! 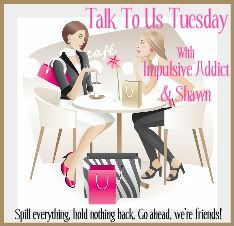 Also, go check out these fine ladies--Shawn and Impulsive Addict for Talk To Us Tuesday! I feel for you. We had a dog that liked to chew my underwear--worn underwear--just the crotch. Yeah. It's fun to hide the underwear in the bottom of the basket just so it's not chewed in the middle of the living room. I have been the cleaning lady for women who don't work outside of the home...have lunch with them after they clean...even if it is pb&j, trust me it will be appreciated!